I love Asian noodle soups. They are comforting and filling meals. Pho, ramen, nabeyaki udon and of course my favourite Wonton Noodle soup are just examples of the Asian noodle soups I enjoy. They follow a simple formula: toppings + noodles + soup = delicious. The noodles just need to be cooked al dente; the toppings provide texture & flavour but the star of the dish is the soup. With warm bowls of noodles, the soup is filled with flavour due the ingredients and seasonings used and the length of time the soup is simmered. The soup ties all the components together and imparts complex flavours to the fare. One noodle soup meal I never gotten into is beef noodle soup. 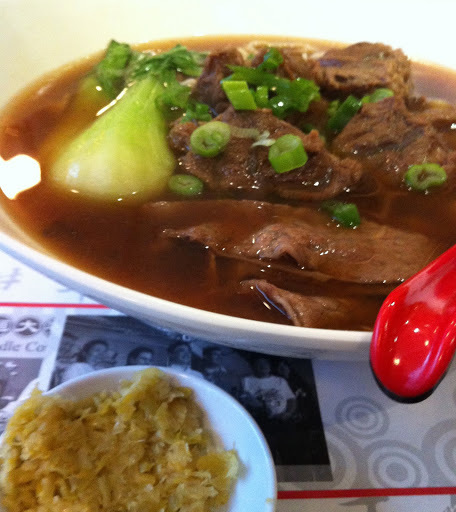 Most in Vancouver called this simple dish Taiwanese Beef Noodles or TBN for short. It is considered a national dish of Taiwan and they even have annual competition to find the best one. 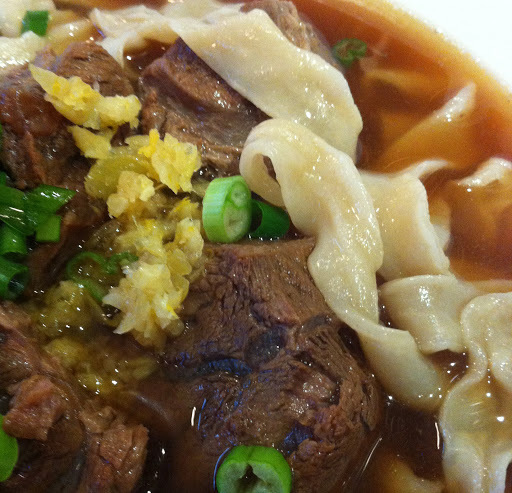 Despite being associated with the island of Taiwan, Beef Noodle Soup is common throughout China. The bowl consisting of stewed beef on top of wheat noodles in a beef broth originated in ancient China (circa Tang Dynasty). Courtesy of Wikipedia, it is believed the beef noodle soup gained its popularity in Taiwan when individuals en mass fled to the island to escape the new Chinese Communist government in the late 1940s and early 50s. The few TBN renditions I’ve had have in the city feature tasteless chunks of chewy beef sitting on a bed of soggy noodles swimming in a bland and one tone beef both. I’ve always thought that it’s not best to judge anything unless you try to the best you can find. So when a multiple award winning TBN chef opens a shop in Richmond, I figure that this would the place to experience a good bowl. Upon arriving at Chef Hung’s in Aberdeen Centre, I ordered the Champion beef shank with noodle in soup and a side dish of Cold mixed baby cucumber. 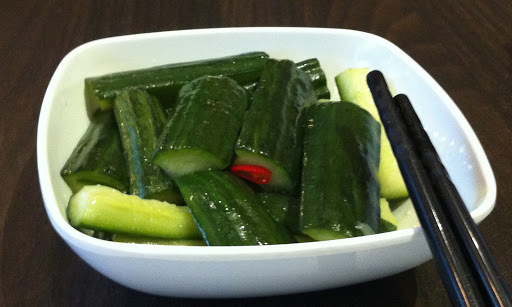 The cucumbers were tart and refreshing. It provided a great contrast to the rich taste of the TBN. The Champion TBN came with large pieces of beef, thinner slices of beef, Shanghainese bok choi and a small dish of minced preserved mustard greens served separately. I choose to have wide noodles and they were prepared al dente. The beef chunks were seasoned well and tender. The sliced beef had a distinct charring taste. When added the minced preserved mustard greens intertwined with the noodles and gave a pop of flavour to the dish. The beef broth was hearty and had layers of taste. The soup definitely was simmered for many hours and I think based on its colour and flavour it may contain goji berries. Most importantly I think the soup contains no or very little MSG since I didn’t feel ill after consuming my meal. Chef Hung’s Champion TBN is an intricate meal with each part of the dish adding its own flavour to the eating experience. As a result I can honestly say this is the best TBN I’ve had. I understand that Chef Hung’s version of TBN may not be traditional but if this is how a good TBN can be then consider me a new convert. Next Post Food for Thought: When does Bastardization become the new Normal?